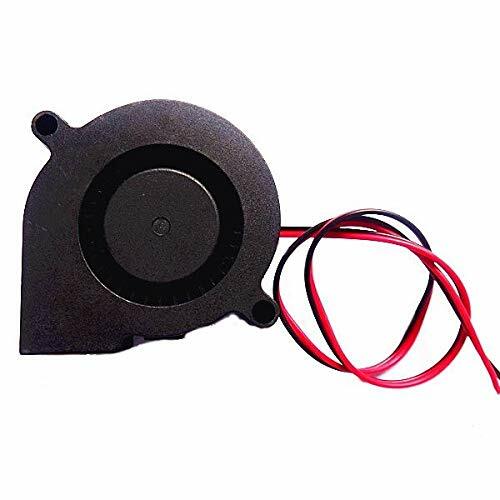 3D Printer 12V DC 50mm Blow Radial Cooling Fan Feature: Excellent for cooling heatsinks on hot ends, prints, or other cooling needs Made of high quality PBT+30% glass line +VO Bearing is high precision, long life and low noise Temperature of usage environment: -20? to 75? Working environment temperature: 40? Service life: Can be continuous working 24 hours Speed: 4500, 6500 (R/min) Voltage: DC 12V Size: 50 x 50 x 15mm Structure: Double ball bearing Package included: 1 x Cooling Fan. If there is a size or colour choice please email me with your choice or it will be sent at random. 3Pcs 3D Printer 12V DC 50mm Blow Radial Cooling Fan Feature: Excellent for cooling heatsinks on hot ends, prints, or other cooling needs Made of high quality PBT+30% glass line +VO Bearing is high precision, long life and low noise Temperature of usage environment: -20? to 75? Working environment temperature: 40? Service life: Can be continuous working 24 hours Speed: 4500, 6500 (R/min) Voltage: DC 12V Size: 50 x 50 x 15mm Structure: Double ball bearing Package included: 3 x Cooling Fan. If there is a size or colour choice please email me with your choice or it will be sent at random.